For those of you who enjoy photography as well as birding, you probably already know about Lowepro and their excellent range of camera bags, backpacks and fannypacks. But now they have also added a range of bags specifically designed for optics users (binoculars as well as spotting scopes) to their line up and I recently got the chance to test the Lowepro Field Station, a purpose-built beltpack designed to give you a comfortable, hands-free way to carry your binoculars and other birding and wildlife gear. 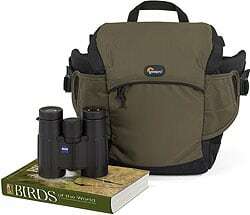 Carry everything you need for a day out in the field: binoculars, field guide, small camera and personal items. Stable, hands-free "QuickShelf" platform that enables you to view your field guide, make notes or even use a tablet-style computer. Lightweight, compact and comfortable with a thickly padded mesh backpad and adjustable waistbelt. 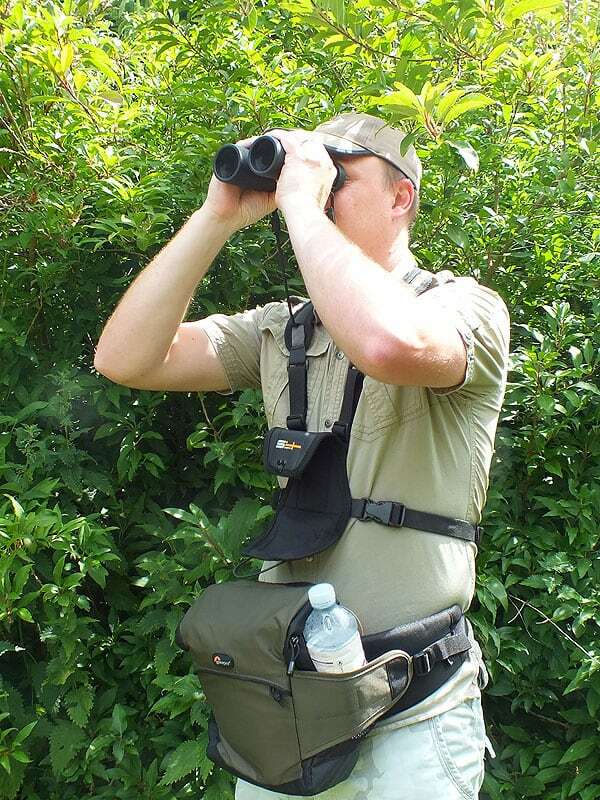 The Lowepro belt bag has obviously been aimed at birders, but I feel it has the potential to be useful to many other people and uses. 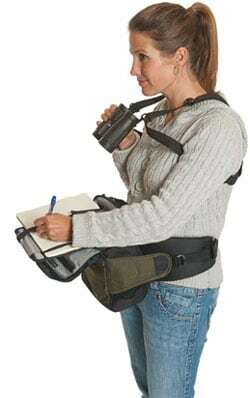 For general wildlife observation and even wildlife researchers who often use binoculars and who need a steady platform to write down their observations or notes or use the platform to support their tablet-style computer like an Ipad. I could also see this bag been used by artists who you use the shelf to store a sketch pad and from which they could make quick drawings whilst out in the field. Taking it out of the box, one of the first things that I noticed about the Field Station beltpack is that it is light. Weighing just 1.6lbs/0.7kg, it is far lighter than my favorite compact camera backpack that I usually use for carrying my binoculars out in the field. It is also far more compact than a backpack, which is ideal if you want to travel light with only your binoculars, guide book and a few other accessories like a water bottle. 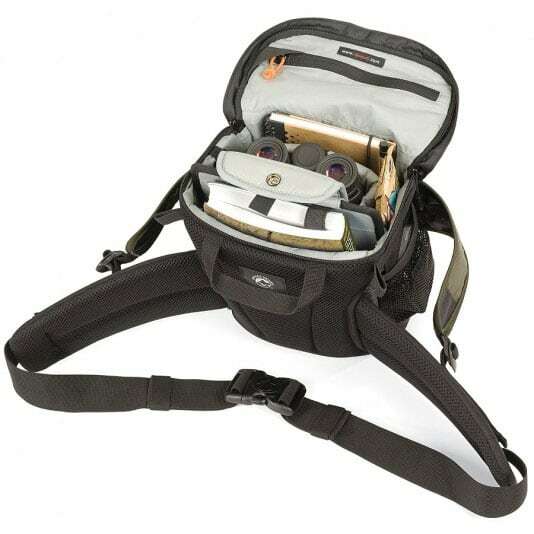 You could also use it to carry a small bridge camera and then carry your binoculars around your neck or with a binocular harness if you still be completely hands-free. The Lowepro Field Station comes with an adjustable waist strap that is divided into two parts, a pair of wide and well padded "wings" that make the bag as comfortable as possible. It also has a mesh backing to it, which means that it is not only comfortable, but will help in a small way to prevent it getting too sweaty on warmer days. On top of these wings is the strap and quick release buckle that covers the two mesh pockets on either side of the bag. I guess this is so that you can ensure whatever you keep in these pockets is secure. 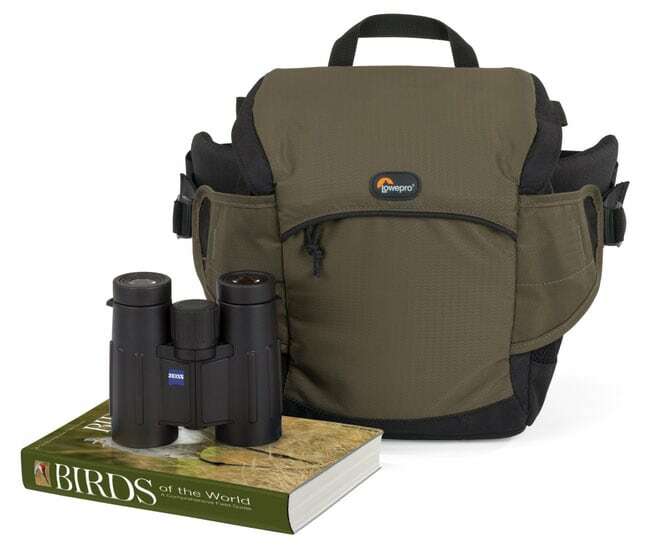 I tested it using a variety of different binoculars and had no problems fitting any compact or mid-sized (objective lens diameters of around 32mm) binoculars into the bag. Full sized roof prism binoculars with objective lens diameters of around 42mm fitted very snugly into the binocular compartment, his "pocket" can be removed if you feel that it is too tight, or if your binoculars are a bit bigger than normal and then they will fit comfortably in the main compartment. Unfortunately I did not have any full sized porro prism binoculars with me, these are generally less streamlined than roof prism designs. My guess would be that a 42mm porro prism binocular would fit, but you would definitely have to remove the binocular compartment. On either side of the bag, there is a mesh pocket, both of which have an elasticated top and the one on the right also comes with a flap that is fastened with Velcro. These make ideal places to carry things like a small water bottle, batteries, pencils or even your lens cleaning kit. Still on the bag's exterior, but on at the front of the bag is a zipped pocket, which is the ideal place to carry things like car keys or some money. The main flap to access the inside of the bag is closed with a good quality zip and under the this lid is another small zipped pocket that once again would be a great place to keep small valuables like money or keys. Inside the left side of the bag is a small pocket that looks like it had been designed to hold things like pens, pencils or a mobile phone. Above this is a snap keyring holder - which is obviously there to hold your keys. The main compartment in the centre of the bag has been designed to carry your binoculars. It is very well padded and the size of it can be slightly adjusted or it can be completely removed, as it is attached to the rest of the bag with Velcro strips. I tested it with a good selection of binoculars and it snugly accommodated most full sized roof prism binoculars with objective lenses of around 42, 43 or even 44mm although the larger ones got very tight. Any larger any you may begin to struggle. Mid-sized and compact binoculars also obviously fitted with no problems. This pocket could also be used to carry a fairly compact camera. Around this pocket there is also room to carry fairly thin items like a note book etc. If your binoculars are too big for the "pocket" it can be removed or you could then use it to carry a larger camera. I tested it with my Fujifilm Finepix HS20 EXR Bridge camera, which is not much smaller than most SLR cameras and it fitted with room to spare, so I would say that it could accommodate most SLR cameras if you wanted to. The "QuickShelf" is stored behind the main compartment along with any book, iPad, or other tablet type of computer attached to it using one of the elastic fasteners on the shelf. This can then be pulled out when needed and does offer a surprisingly stable platform from which you can use to look up a bird, animal, spider, flower tree or any other reference book that you may have. You could even use it to jot down notes or even perhaps make a quick sketch if you are an artist. Overall I was very impressed just how well thought out the storage on this bag is. Lowepro really have given you a place just about everything you might need not only birding, but many other uses. Testing the bag, I took it out with me on a number of walks and I must say that it does work really well and is very comfortable. This was even the case when I had it fairly fully loaded with my full sized 8x42 binoculars, a large bird book, a compact camera, my cell phone, my keys and a wallet. When not actually using the bag, I found the most comfortable way to walk with it was to swing it around, and use it more as a bum bag. Accessing your binoculars and your reference book is fairly quick and easy, although to make it as quick as possible and to ensure that you don't scare away birds with the un-zipping sound, I kept the lid closed but unzipped whilst not actually using it. The shelf works really well and it is something that I really liked. In the past I often did not bother to take a field reference book with me as they easily got damaged in my back pack and were just too much of a pain to access. With the Field Station, there really is now no reason not to take one with you as they wont get damaged and are really easy to access. I also like the attention they have shown to detail with the elastic strap that you can use to keep a place in the book for even quicker access. I always like to take some sort of camera with me and on my first few walks with this Lowepro bag, I just took my compact Panasonic camera which easily fitted next to the binoculars in the main compartment. This camera is fine for taking general scenic shots, but the camera is just not good enough when it comes to taking photos of birds and other wildlife. My latest camera that I have been using is a Fujifilm Finepix HS20 EXR, a fairly large bridge camera, which fits pretty well in the Field Station with the binocular compartment removed. 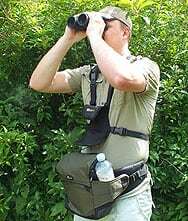 Then for my binoculars, I just used my favorite binocular harness, the LockDown Optics Deployment System, which meant that I now not only had my bird book, binoculars and best camera with me, but was still completely hands free - Excellent. Overall I really like this bag, it is very well made with high quality materials. It also not only works very well, but is also comfortable when worn for long periods even when full. 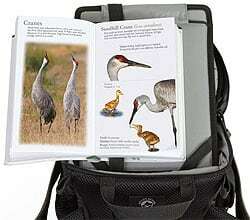 For bird watching it is excellent, but is versatile enough to use in a variety of different situations. The flip out shelf is a great feature that has been very well thought out. As such I have no hesitations in highly recommending it to anyone looking for a small lightweight solution to carrying your essential field equipment. I would like to thank Warehouse Express for organising the Lowepro Field Station bag to be sent to me to review. I would also like to point out that all the reviews on this site, including this one are my opinion and are not influenced in any way by manufacturers, distributors or suppliers. I do however think that it is worth noting that at the time of writing Warehouse Express have it listed on their site for £139. Check current price on Warehouseexpress.com.